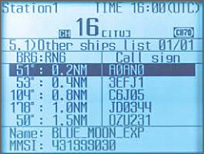 The VHF radiotelephone has an intercom functionality for easy communication with multiple other VHF controllers onboard! Additionally, to always be in full control and on top of communication with deck or dock hands, a loudhailer function is built in. An optional external speaker with amplifier increases talk power, making your messaging loud and clear, thereby adding to the safety of the vessel. Improved visibility is realised by the integrated 3.8" high brightness silver LCD screen with excellent sunlight viewability. 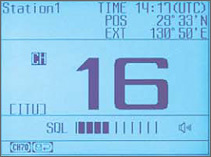 The main data is displayed in large characters for easy reading. The JHS-770S/780D is developed upon maximum flexibility, having a separate transceiver and controller allowing flexible installation in confined spaces. Either panel, desktop or overhead mounting is possible with this size reduced VHF radiotelephone. The combination of push buttons and JOG dial operation, together with JRC's innovative software including easy menu structures ensures logical, accurate and convenient operation. JRC has been providing sales and support of products since 1915! Today, JRC offers comprehensive support through its organisation, in partnership with a world-wide StarNetwork™ of over 270 fully qualified agents, giving support 24 hours a day, 7 days a week, and 365 days a year!